Maes-yr-haf, 5 boutique styled ensuite bedrooms - with your own bar and river ! Set in an enviable location very close to the famous Three Cliffs Bay this large property set in its own grounds offers plenty of room and facilities for up to 10 persons. 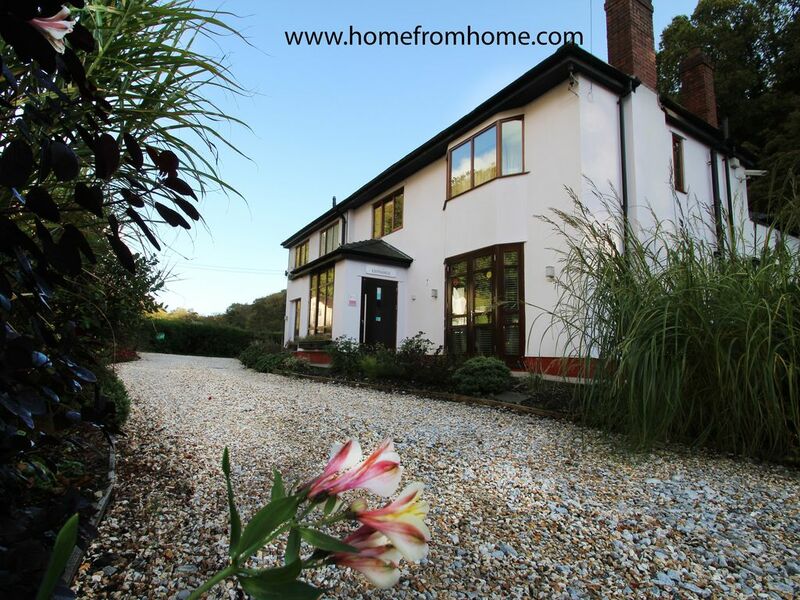 5 double bedrooms all ensuite with a large lounge dining area plus a bar area with log burner. Wi-Fi, flatscreen TVs in each room, fully fitted kitchen with all appliances and a separate wash/ shower/ storeroom. Ample outside areas. These rates supersede the minimum rate quoted for 3 night stay in the rates section of the site. Please contact for a specific quote for a short term stay. This property is close heart having purchased it in poor condition at auction spending two years renovating it to a high standard. It functioned as a boutique restaurant with rooms until 2013 when we changed its use to a dedicated holiday home, retaining the boutique hotel feel by keeping all bedrooms ensuite and retaining the popular bar area. We find it is enjoyed variously by couples/families coming together for special occasions or multigenerational family holidays. As well as being centrally located in the heart of the beautiful Gower Peninsular there are memorable walks straight out of the door, particularly the short walk down the valley to the famous Three Cliffs Bay. This property is very quirky, set in a stunning location. Having the whole place to ourselves was brilliant. Rooms were very comfortable , beautifully decorated and the ensuits were great. A couple of issues with the plugs in the bath but that wasn’t a major issue. This place was perfect for our family get together (there were 9 of us) and I would recommend it to anyone. Lovely house with plenty of room for all the family. Lovely house with lots of space for large families or groups of friends. Great fun to have your own bar to stock as you wish. It's within walking distance of the beautiful Three Cliffs Bay and easy drive to other local beaches. Plenty of things to do and see in the local area. We really enjoyed the possibility to spend time together or to meet in small groups. There was space enough for children and an appropriate atmosphere for adults. The place is close to the coast and close to the museum and not far from the city for shopping. We had a great week with the family including 2 toddlers in this nice property. It was pretty well equipped, clean and spacious and the novelty of our own bar area and plenty of seating made this an ideal choice. The Gower is a beautiful spot and the proximity of Three Cliffs Bay was one of the attractions. Ir proved bit more of a hike than we expected albeit a plants walk across fields and sand dunes but too far to "pop back" for replenishments and too far also to lug lots of beach stuff. Nevertheless there are plenty of alternatives not too far away by car. There is plenty of outside space too- sadly no garden or lawn but room enough for kids to run around, barbecues or generally lazing around. Of course the weather plays a big part and the property is roomy enough for a large group not to be under everyone's feet. the owner was helpful on the couple of occasions needed and very close at hand without being intrusive. Would recommend for a large family group or a number of friends. 5 en suite bedrooms is a major plus.